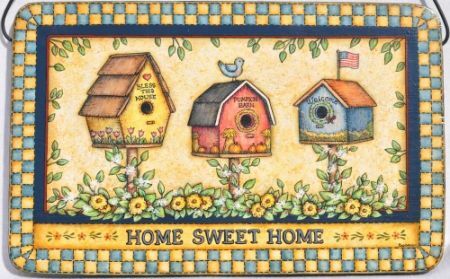 Featuring three birdhouses in a garden of yellow flowers surrounded by checks and the saying “Home Sweet Home”. It is painted on a wooden plaque measuring 9” x 5 3/4” but could be enlarged and painted on a larger surface. This e-packet contains: Complete directions, two color photos and one full size pattern page for a total of 5 pages.